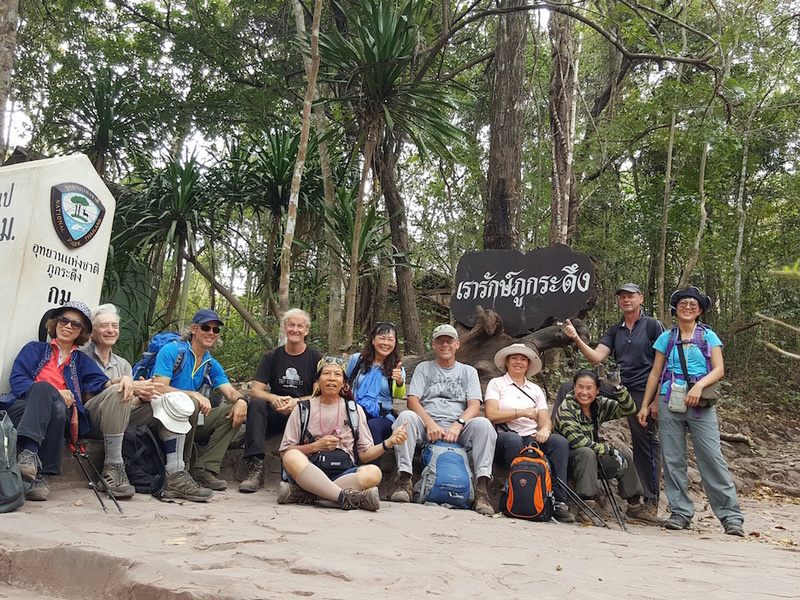 Seventeen members of the Chiang Mai Hiking group traveled to Loei Provence for a three day exploration of Phu Kradueng National Park. 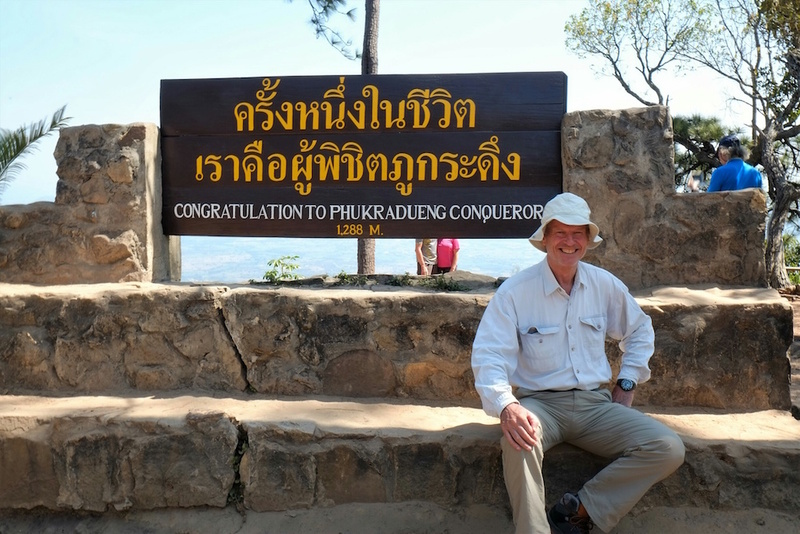 Established in 1962, Phu Kradueng is Thailand’s second National Park. 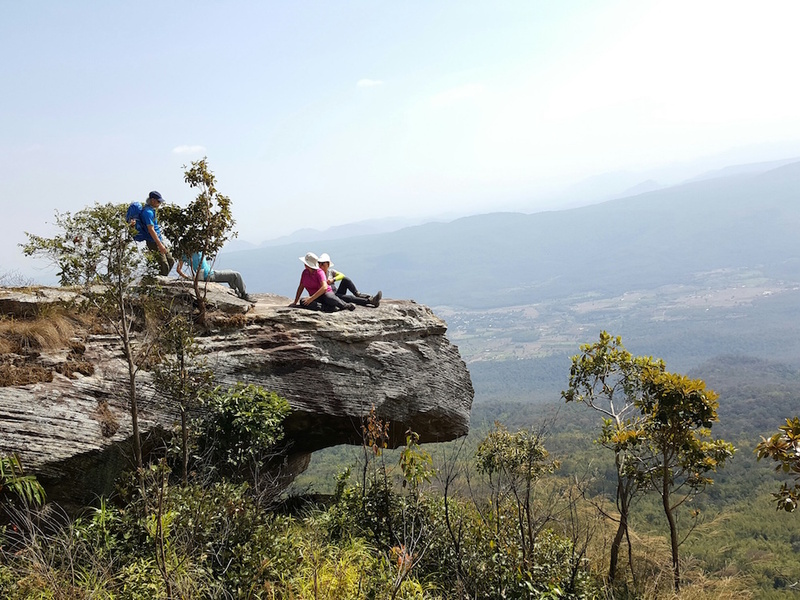 The Park is comprised of a large sandstone plateau with an average elevation of 1200 meters which provides a cool climate year around. 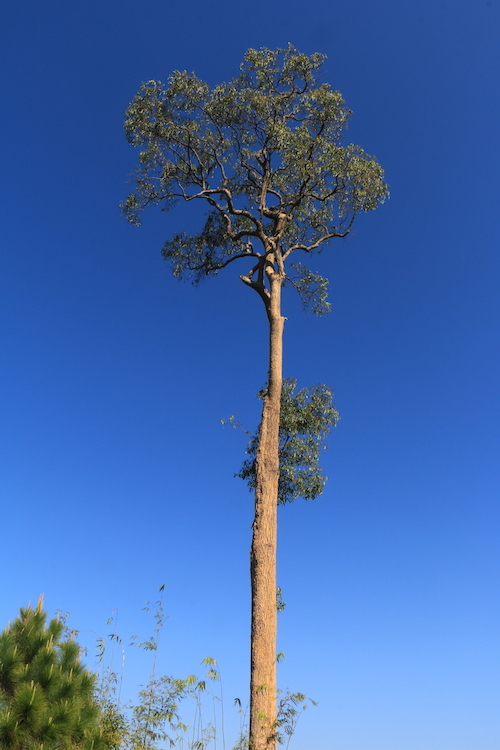 Pines, oaks and maples populate the summit plateau, which is inhabited by elephants, tigers, back bears and several varieties of deer. 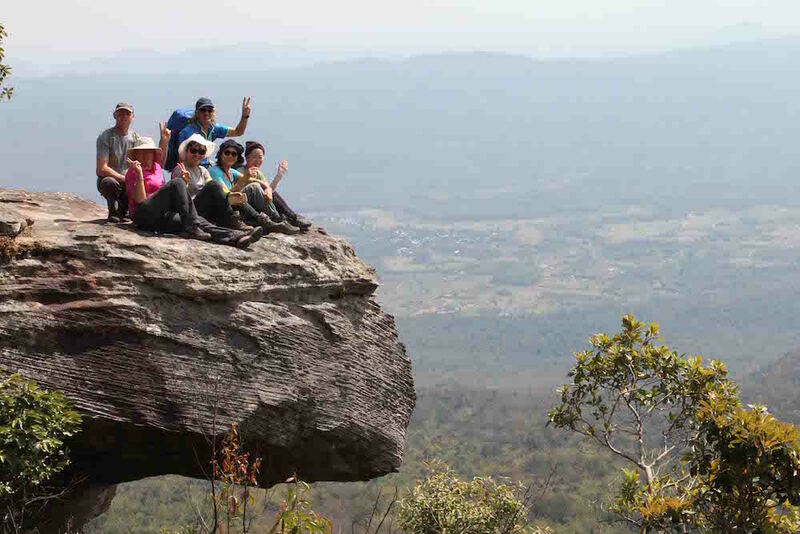 The southern rim of the plateau is bordered by cliffs and waterfalls. 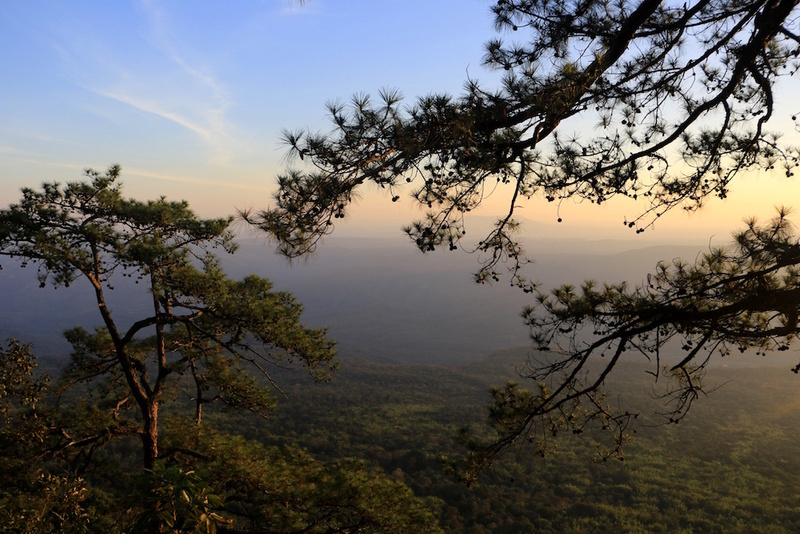 The headwaters of the Lam Nam Pong River course through the plateau providing a unique riparian zone home to exotic flora and fauna. 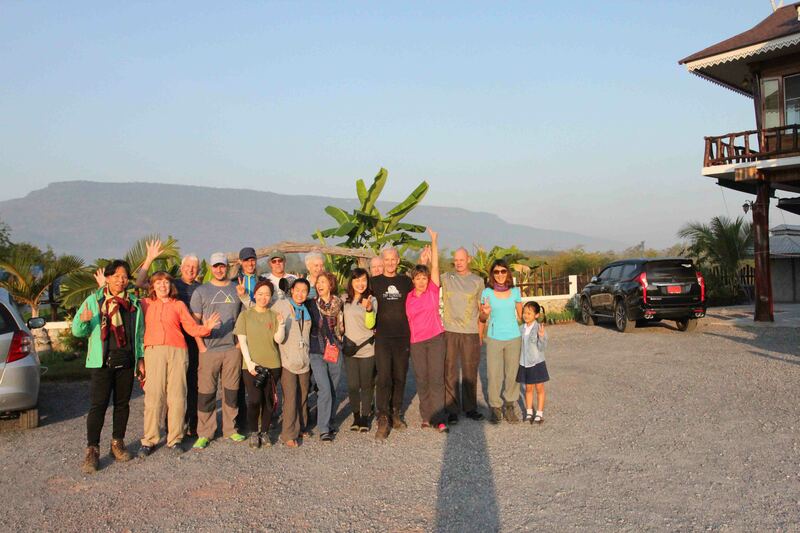 Our group traveled to the village of Phu Kradueng on Monday and spent the first night in the Khum Bong Kaew Resort in the shadow of Phu Kradueng (Photo 1). Accommodations at this new small resort were quite comfortable. 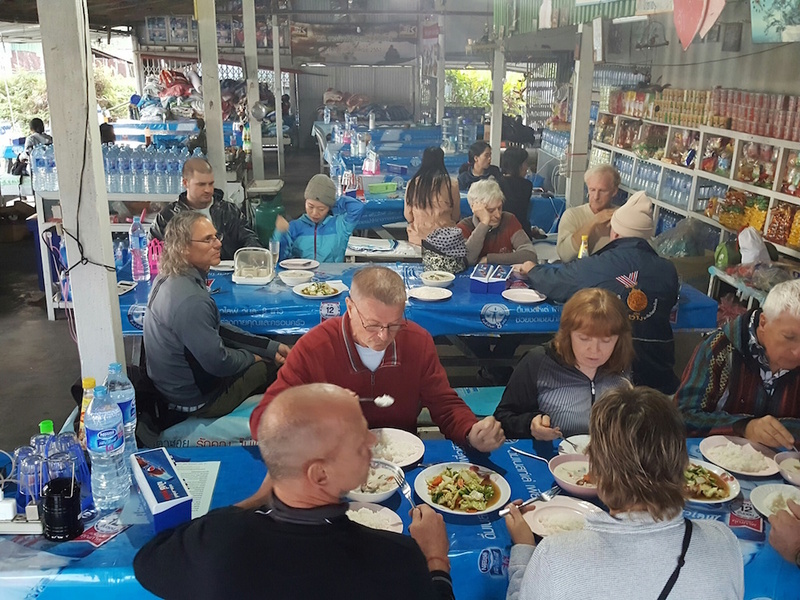 The proprietress of the resort, Khun Sarunya, kindly referred us to the Ban Phuean Restaurant in the village of Phu Kradueng, where our group enjoyed a delicious meal of Thai and Issan style dishes. 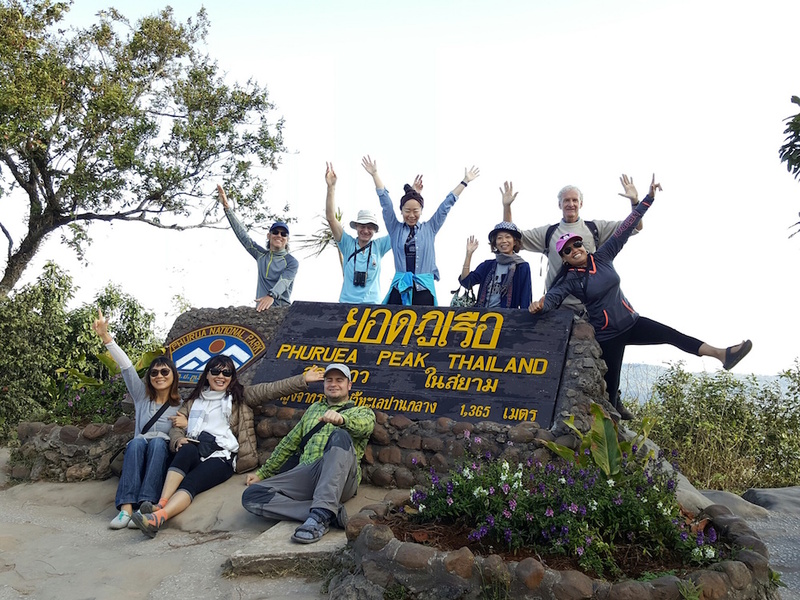 Early Tuesday morning our group left for the Park entrance, there to pay a 400 baht fee per person for foreigners and to make arrangements for porters to carry our heavy items to the summit camp. 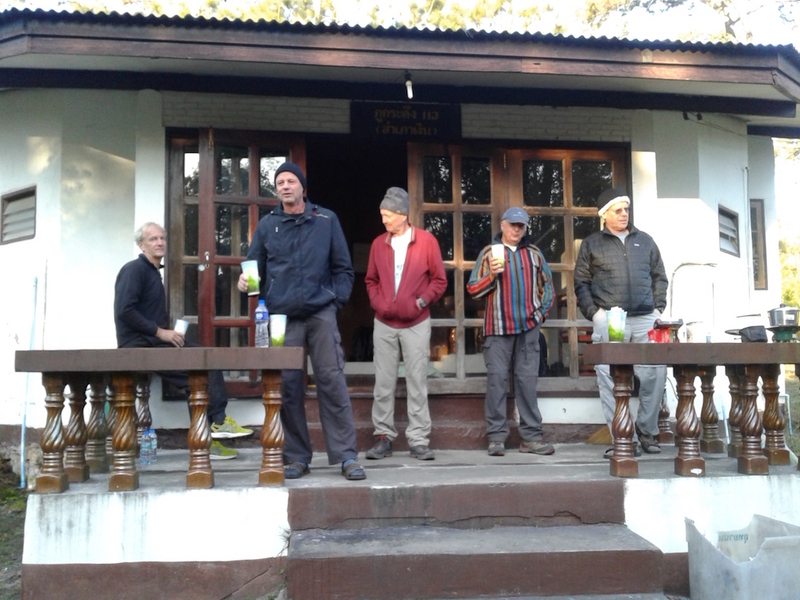 We started the 5.5 kilometer, 1000 meter climb to the rim of the plateau at 9 am. Along the way we found many small shops where one could buy snacks and drinks, as well as T-shirts and other souvenirs. 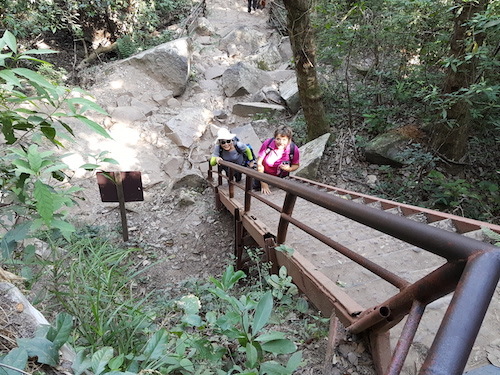 The route was steep in places, especially near the summit where several sets of steel stairs have been installed (Photo 2). 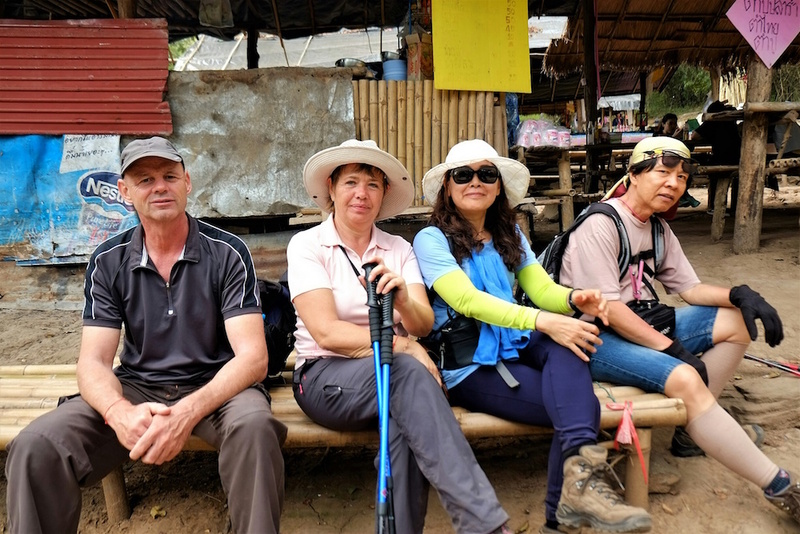 We completed the climb around noon, and enjoyed a brief rest at the Mountain Top monument (Photo 3) before hiking an additional 4.5 kilometers to the summit camp where our cabins were located. 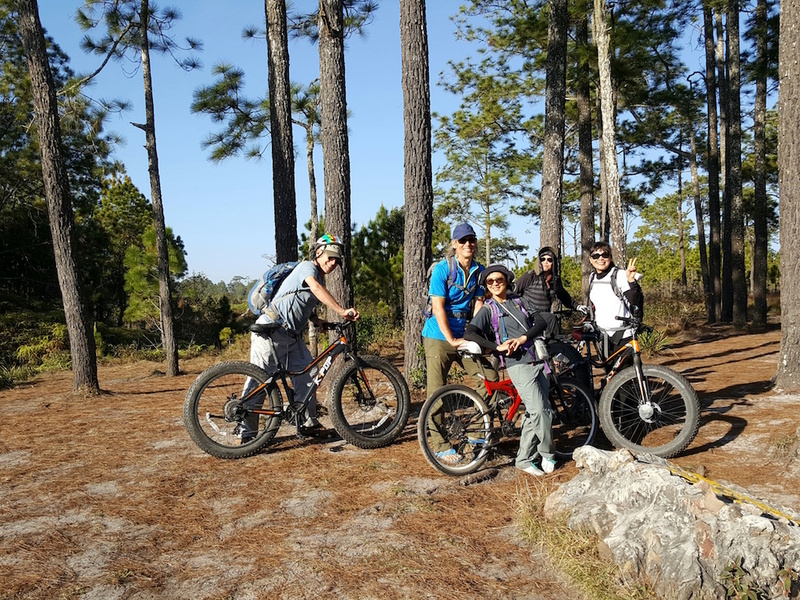 Our group had reserved two cabins, each with three bedrooms and two baths which included hot showers. 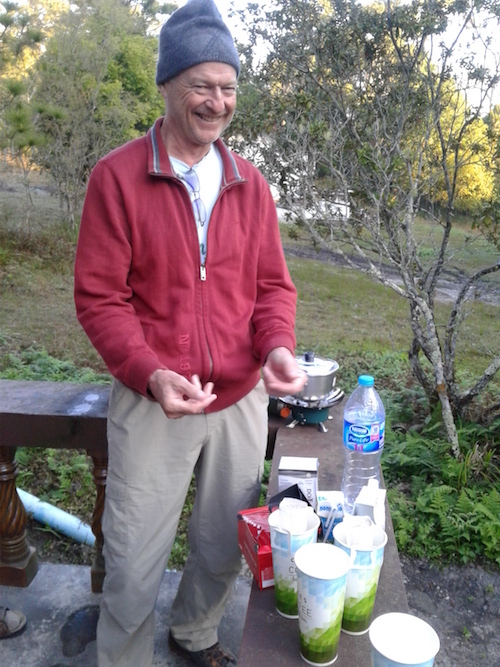 After some preliminary exploration we enjoyed an early dinner at one of the six restaurants located at the summit camp (Photo 4). 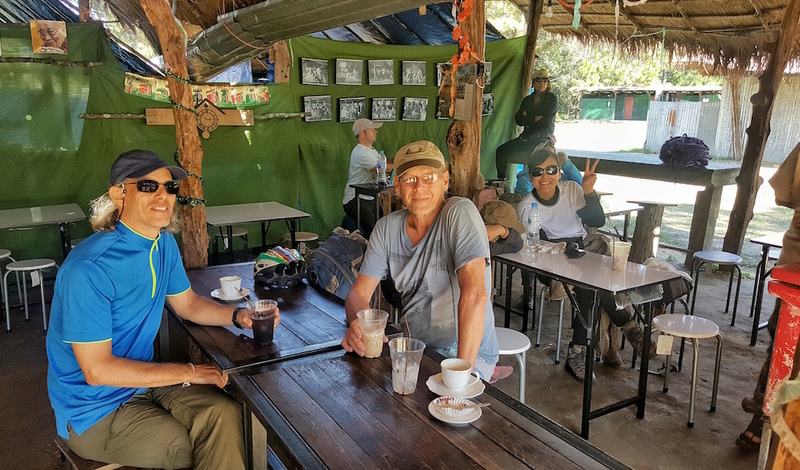 Early Wednesday morning after breakfast our entire group hiked through a beautiful riparian zone surrounding the headwaters of the Lam Nam Pong River. 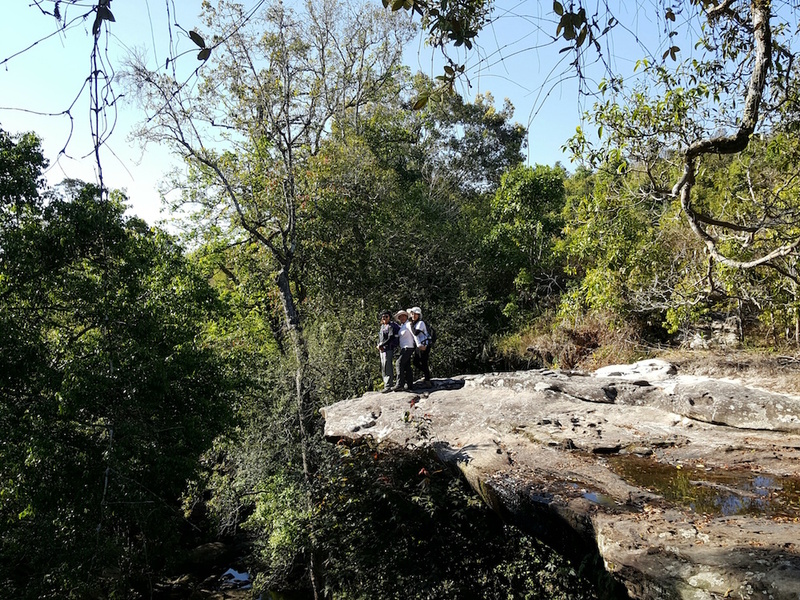 About 2 kilometers from our cabins we encountered Pen Pob Mai Waterfall (Photo 5) which unfortunately contained only a trickle of water at this time of the year. 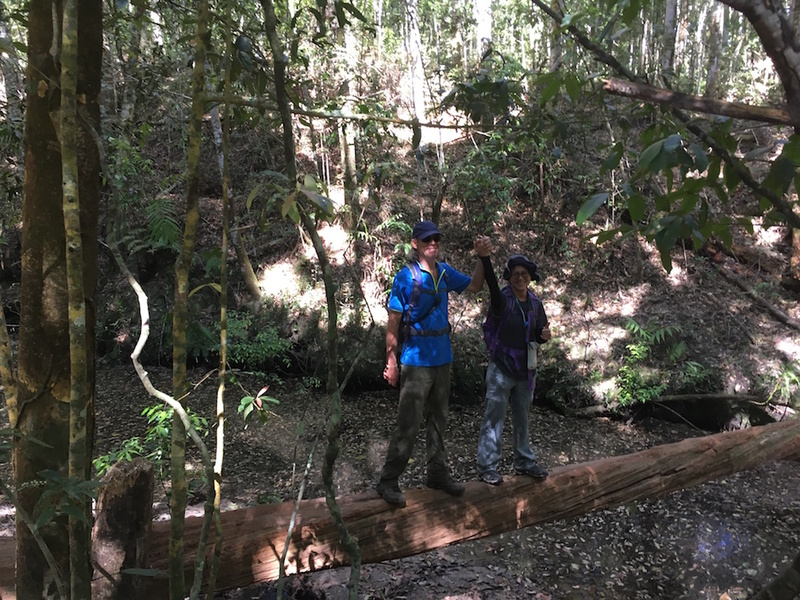 From this point we descended into the river ravine, encountering interesting rock formations (Photo 6) along the trail and many log bridges across the stream that provided challenges for the adventurous (Photo 7). 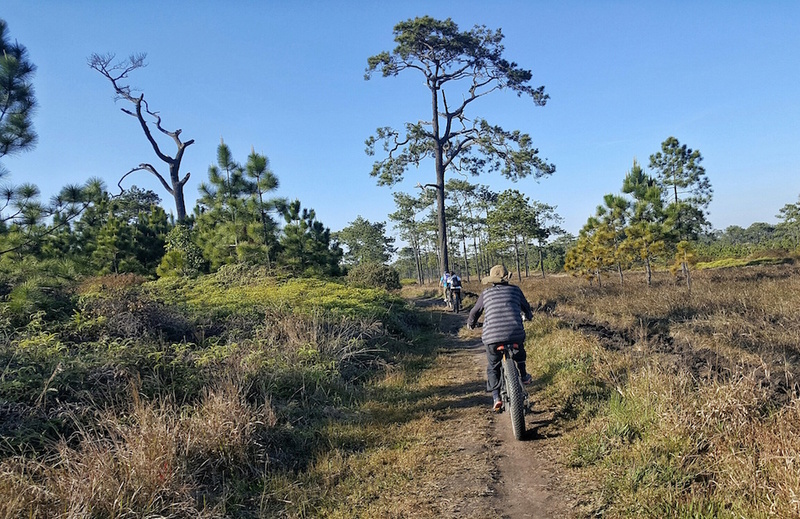 One hiker who had forged ahead of the group reported sighting a wild elephant through a thicket of bamboo. 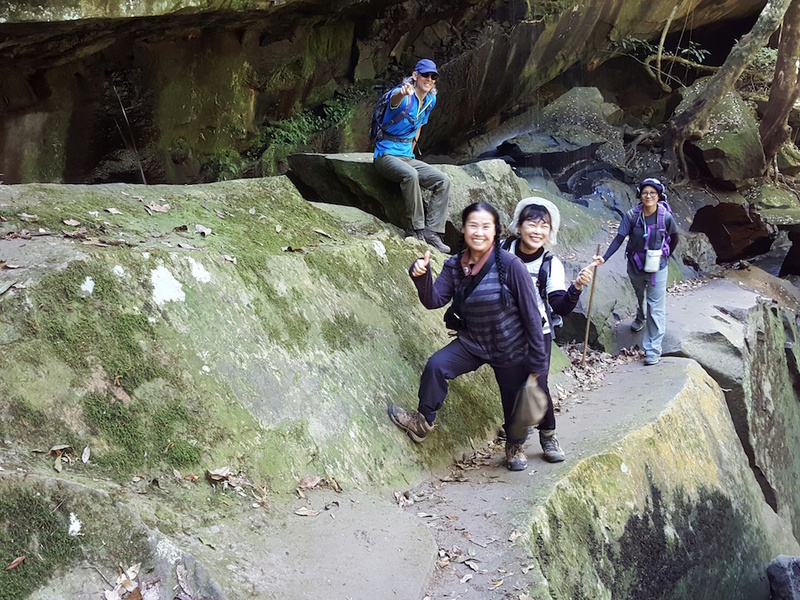 After hiking another 2.5 kilometers, we arrived at Than Sawan Waterfall (Photo 8), the last waterfall on this trail. 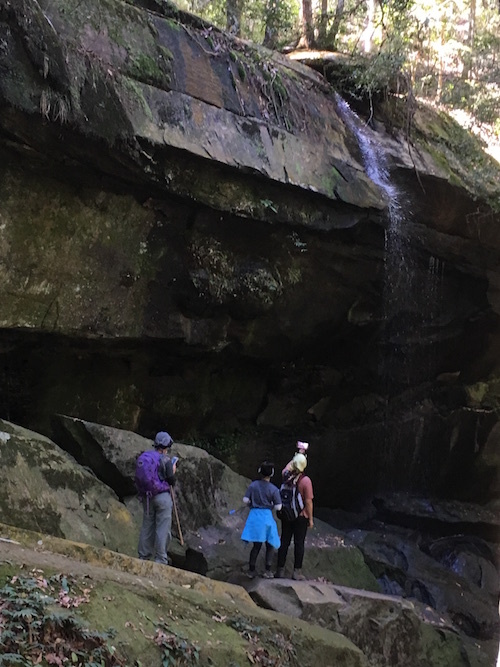 While the volume of water was low, the beauty of the forest and the rock formations (Photo 9) provided ample compensation for our efforts. 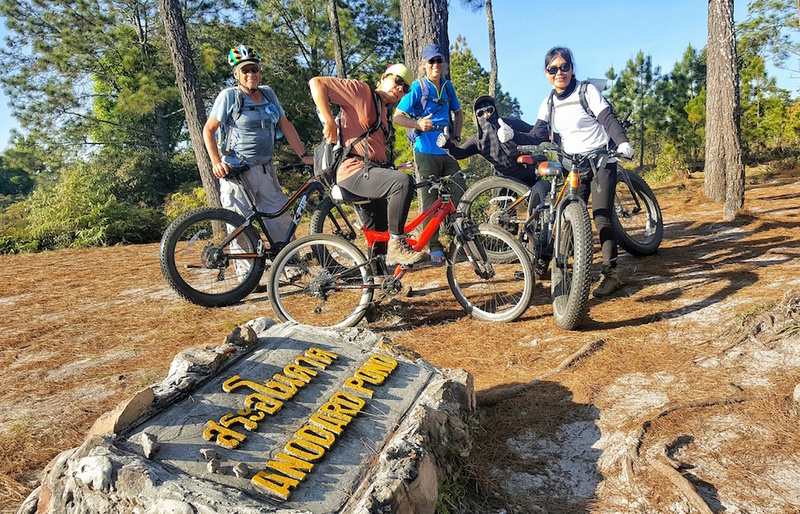 At this point, the group split into hiking groups and biking groups (Photo 10) to explore the trails along the southern rim of the plateau. 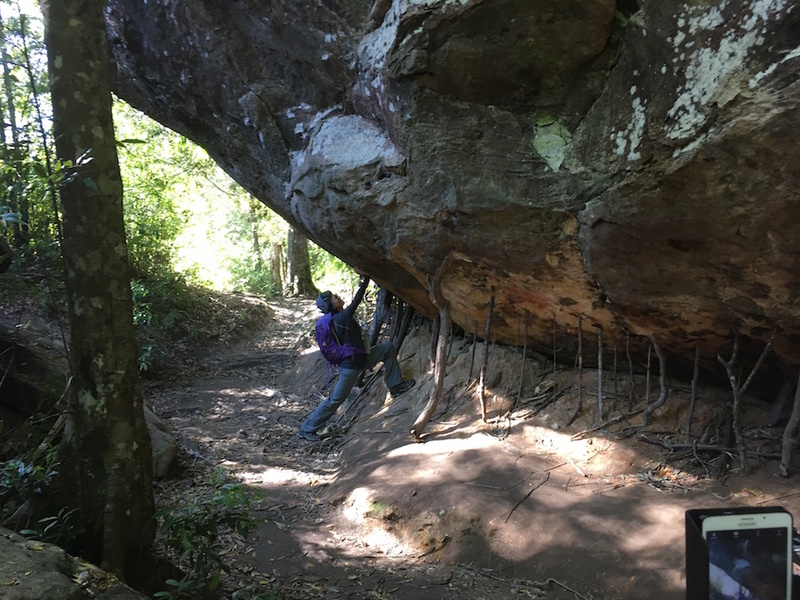 Cliffs with spectacular overhangs provided interesting backdrops for photos (Photos 11 and 12). 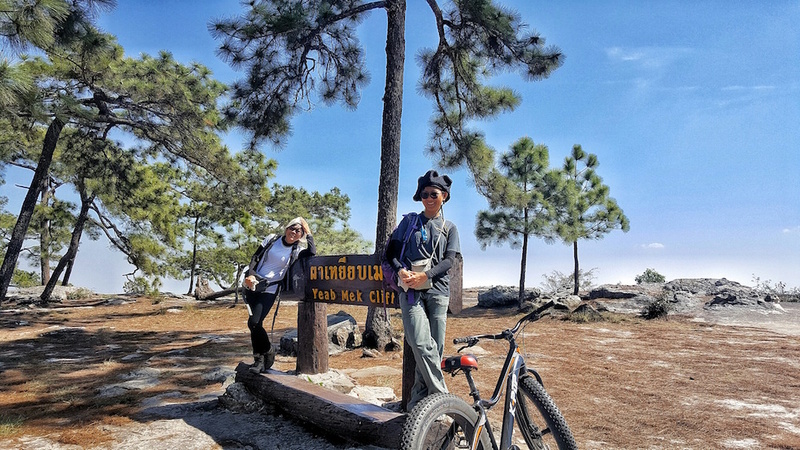 Both the hiking and the biking groups traveled as far as Lom Sak Cliff, the site of many famous sunset photographs. 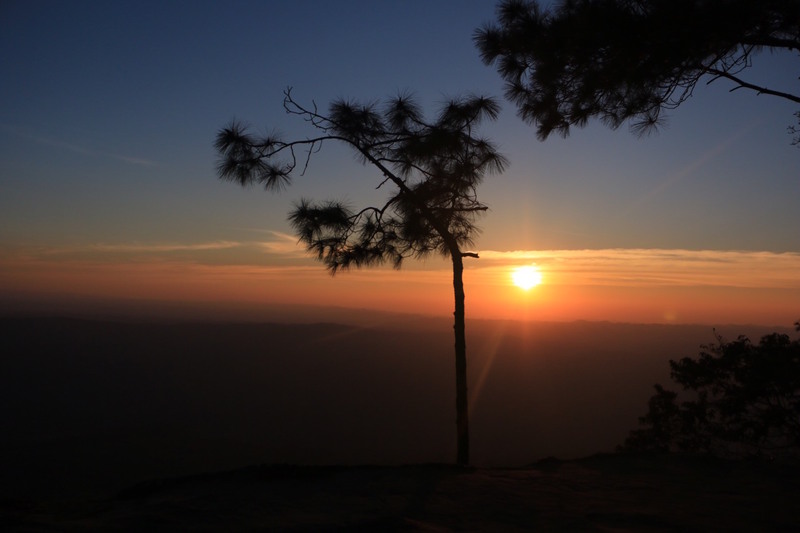 Several in our group stayed long enough to capture their own sunset photos (Photo 13). 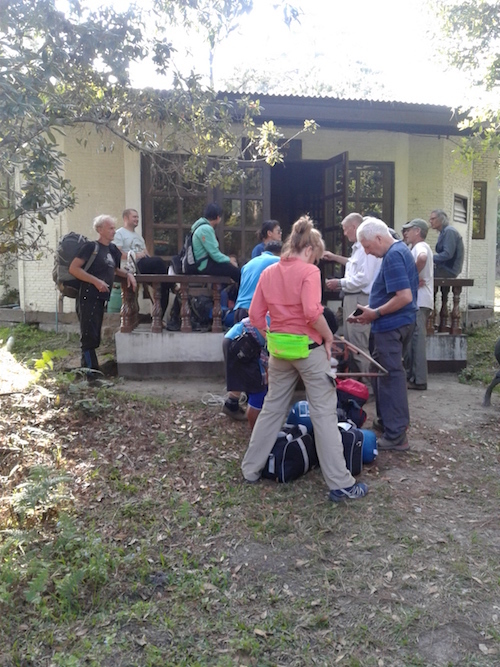 Thursday morning we checked our bags at the porter station, had breakfast and began our climb back down the mountain, arriving at the Park entrance between noon and 1 pm (Photo 14). 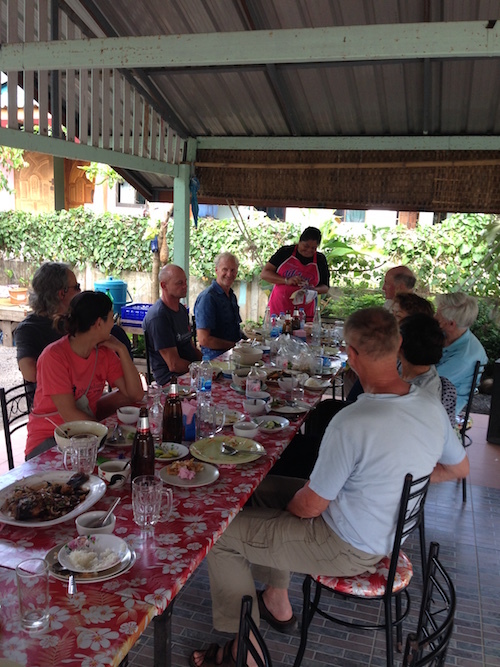 Having developed a healthy appetite, we called the Ban Phuean Restaurant to inquire about lunch for 17 hungry hikers. The owner and cook (Photo 15) was again able to provide a variety of delicious dishes on short notice. 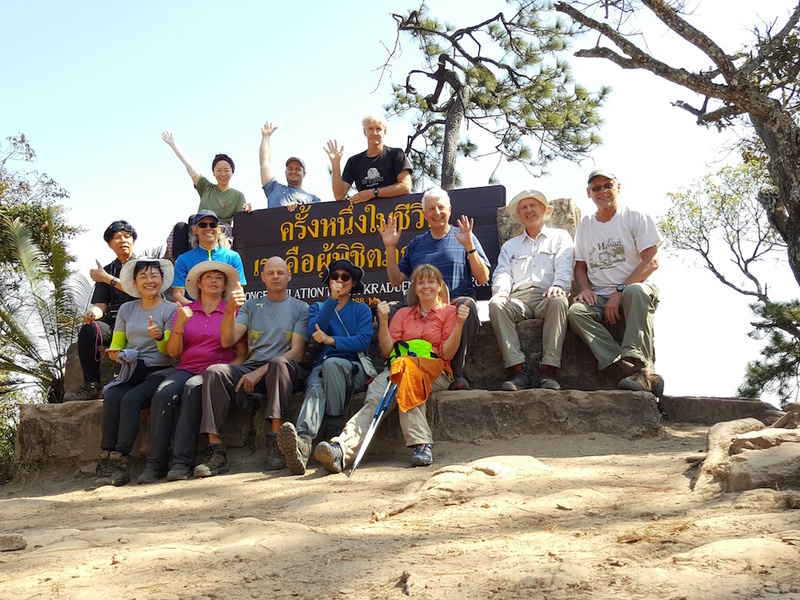 After lunch the group departed Phu Kradueng. 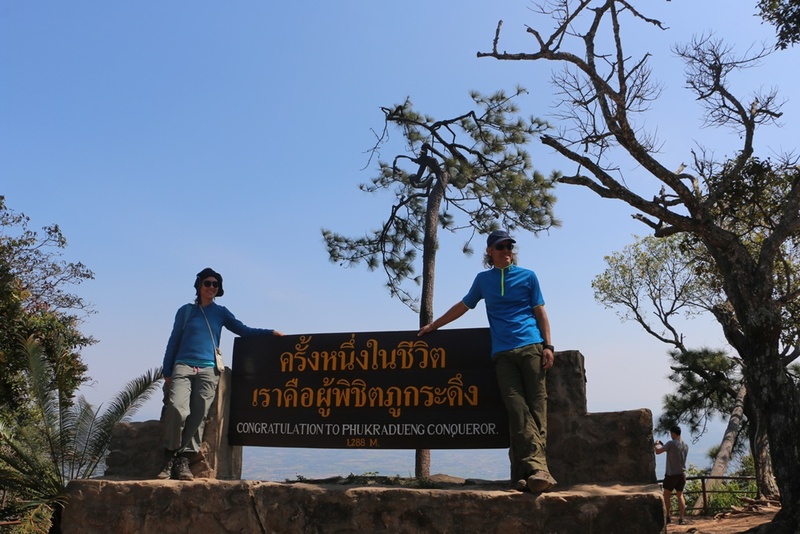 Most then traveled to and spent the night at Phu Ruea. 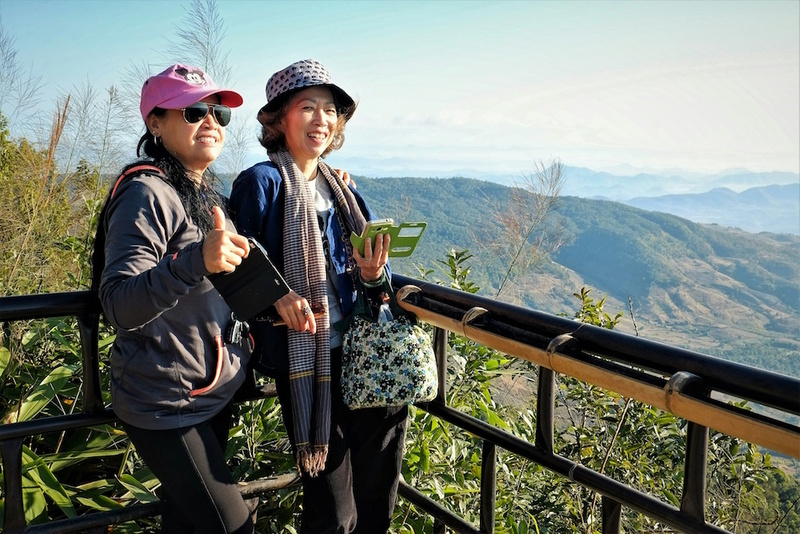 On Friday morning we completed a quick reconnaissance of hiking possibilities in Phu Ruea National Park (Photo 16) before returning to Chiang Mai that afternoon. 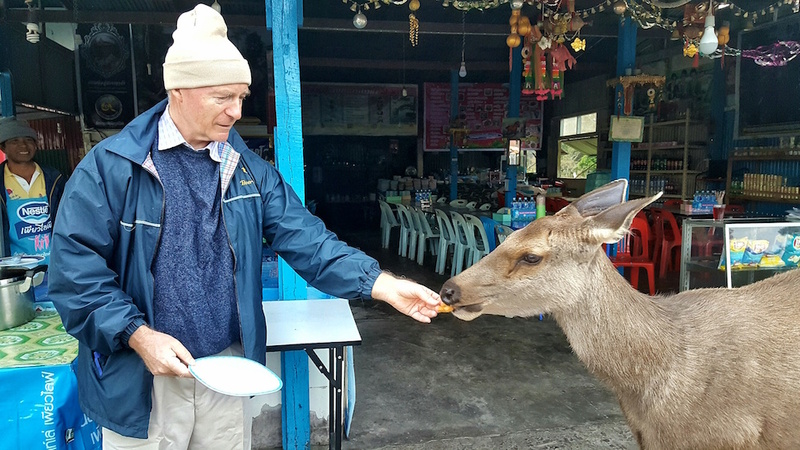 This was a very enjoyable outing to a National Park that offers scenery and wildlife different than seen around Chiang Mai. 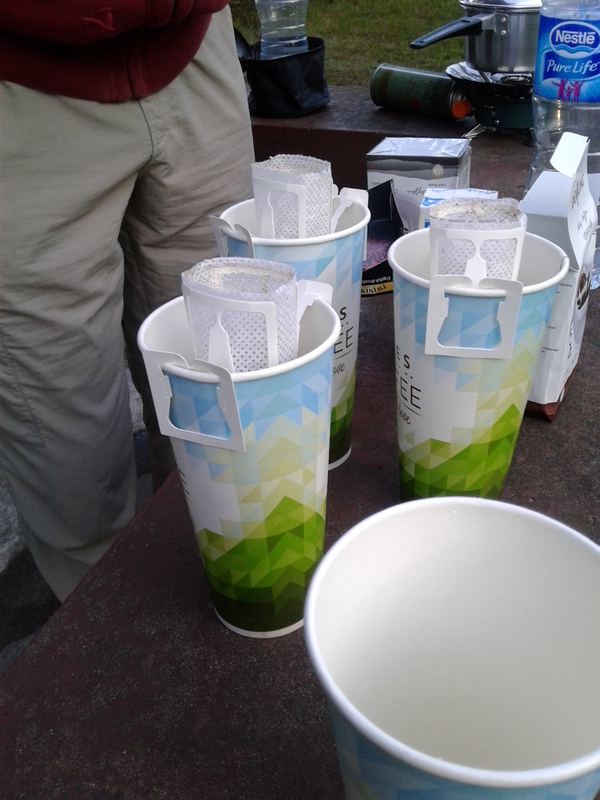 I believe the group consensus would support another visit to this area at some time in the future.